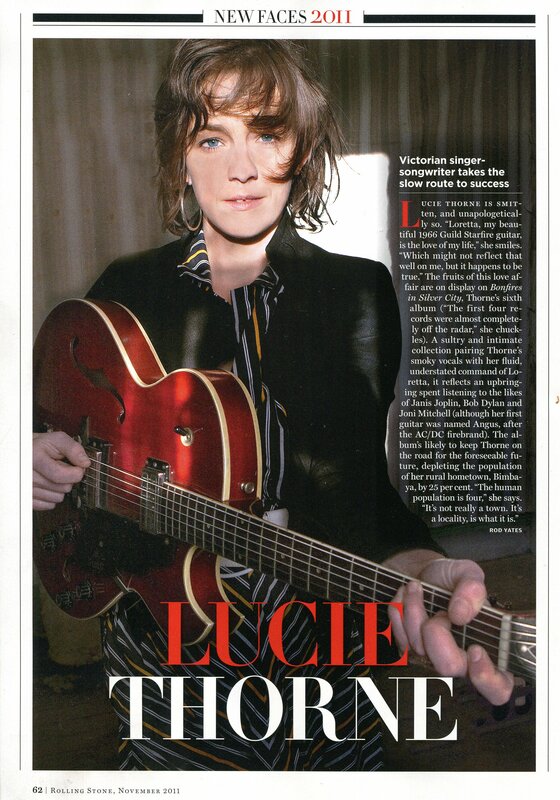 'Meesterwerk Feature Album' review in 'Heaven' Magazine - Nov/Dec 2010. 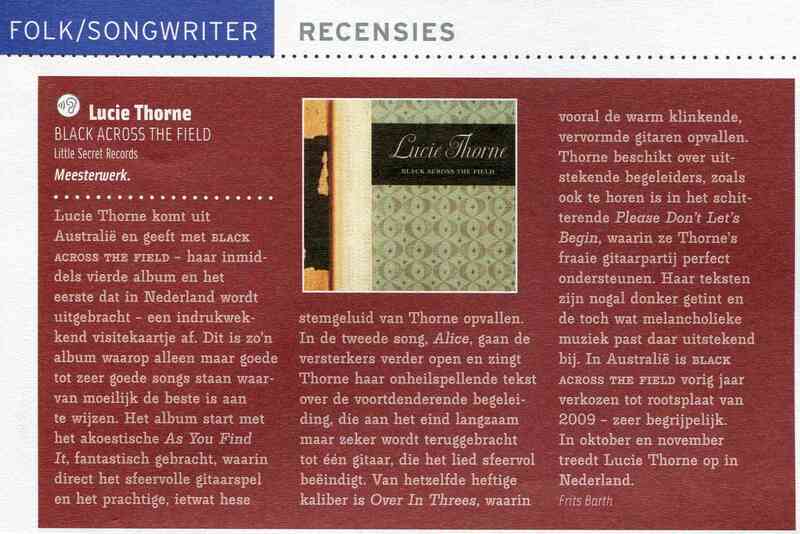 Album Review by Nobert Tebarts in 'Written In Music' - Sept 2010. Album Review Jan Willem Broek 'Subjectivisten' - October 2010. Live Review from Roepaen, Ottersum, by Jan Jannssen, November 2010. "... Surprise turned to intense anticipation when Thorne took the stage with legendary drummer Hamish Stuart, a man whose impeccable musical credentials include a long stint as part one of the rhythm section for the late, great Jackie Orszaczky. The critical response to Black Across the Field has been adulatory and justifiably so... she is a rare talent the kind of artist that stands out in the overcrowded field... I found myself drawn in quiet awe to Stuart's sympathetic precision with Thorne's playing... the intense communication between the two musicians pulls the listener into stories told in song..." Live review by Arts Hub from The Clarendon Guest House, Katoomba, 16/04/10, duet show with Hamish Stuart. "I'm still getting over the show South Coast singer/songwriter Lucie Thorne put on at the Mullumbimby Bowling Club last week. Maybe it's not specifically roots music in style, but in my book there's nothing more 'roots' than someone standing up there and spellbinding an audience with nothing but a guitar and a voice. Switching between clean and just slightly driven channels on her little Mesa Boogie amp, adding a little colour with a tremelo pedal, Thorne accomplished what all great folk singers have - a genuine conversation/duet with her guitar. Thorne has put so much thought and feel into not only the structure but the tone of her live performance, that you don't miss the lack of a band for a second. And considering Thorne has gun bassist Dave Symes and drummer Hamish Stuart backing her on the new record - and live when they're available - that's a considerable achievement.